Lucas Rage, may have been spotlighted as a collector in Sociology 300, but his p0wer0wl YouTube channel deserves to be reviewed as an independent website. Tim Drage’s channel was not reviewed as a “website” because his videos featured a variety of subjects. Website Review #4 covered the entirety of Tim’s M.U.S.C.L.E. realted work. This review focuses on Lucas’ entire YouTube “channel” because his page features exclusively breathtaking M.U.S.C.L.E. videos. The p0wer0wl videos are amazing for a variety of reasons. One of the main reasons is that he has chosen quality over quantity. YouTube channels often seem to be filled with garbage and occasionally a gem can be found. Here the gems are front and center. A second amazing characteristic of these videos is that they break the “less is more” mantra of internet videos. Often videos that gain popularity, and are not music videos, provide an instant pay-off; for example, The Sneezing Baby Panda (16 seconds) and David After Dentist (1 minute, 59 seconds). If you look at YouTube’s most viewed videos most are under a few minutes. Lucas is able to post entertaining videos at over 3 minutes and over 9 minutes. Both videos also have stunning production quality and sound, with wonderful attention to detail. The content of each video deserves to be further commented on separately. HABABABAH 01 is a wonderful and entertaining M.U.S.C.L.E. video, and appears to be a fantastic introduction into an ongoing series. Arguably one of the strongest elements of the video is the use of multiple methods to puppeteer the figures. By switching between methods it seems to inject a freshness and uniqueness into the scenes. Viewers don’t become “immune” to one constant method. While the video is devoid of any dialogue it doesn’t hinder the understanding of the action taking place. This is a result of wonderful framing choices and beautiful set design. 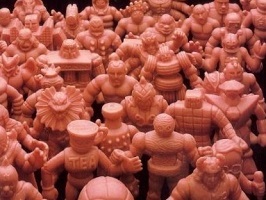 The world around the M.U.S.C.L.E. figures provides structure and even a degree of realism. The mouth of Castle Grayskull was used, but care was taken to enrich the look and make it unique. There simply isn’t enough praise that could be heaped onto this video. Where HABABABAH 01 is accessible to anyone, Plan Nine From Outer Space certainly appeals to a more specific audience. The nine minute film is not a shot for shot remake but a seemingly loving homage using the actual audio from the movie. To get a sense of the similarities and differences the first, almost, 10 minutes of the actual Plan 9 from Outer Space is shown alongside p0wer0wl’s Plan Nine From Outer Space below. The use of various Little Rubber Guys actually enhances the video. Whether intentional or accidental it seems to mirror the oddity of the actual cast of characters from Plan 9 from Outer Space. Similar to HABABABAH 01, Plan Nine From Outer Space gains adoration from the various puppetry methods and set design. This video appears to have even more effects, but possibly the most important effect is the “film deterioration” that is added. It is especially noticeable during the opening minutes, creating an appropriate tone. Unfortunately the scenes appear to get a bit brighter and the effect become less noticeable. The design of the website is driven by the YouTube format, but thankfully it remains simple and readable. Far too often users attempt to put pictures as the background and the channels main page begins to look like an autostereogram. The design of everything in the videos is fantastic; from the clever re-use of Castle Grayskull and GI Joe’s Mobile Command Center to the impressive grass, dirt, and sand. It is impressive the variety of accessories and settings that are used, but always appear to be in an appropriate scale. It has been stated several times already, but the look of these videos is fantastic. The images from the HABABABAH 01 video are some of the best, if not the best, shots of collective groups of M.U.S.C.L.E. figures in new and unique settings. His creative and fun videos certainly enrich the M.U.S.C.L.E. community, and provide a new standard to which all other videos will be measured. This entry was posted on Friday, January 8th, 2010 and is filed under UofM News. You can follow any responses to this entry through RSS 2.0. You can skip to the end and leave a response. Pinging is currently not allowed. Holy hell that first video was awesome! Must have taken some time to make! greetings, i actually lucked out and saw “HABABABAH 01” after someone mentioned it in the shoutbox at the LRG forum and loved it. from there i saw his other video posted as plan 9 and giggled furiously as i loved the original ed wood movie for it’s absolute horribleness. truly an epic fail of movie film making. the muscle version was superb as it brought out my nostalgia for the original film but also gave it a uniqueness for having muscle figures to represent the original cast. fantastic. i would agree that these are some of the best on youtube!